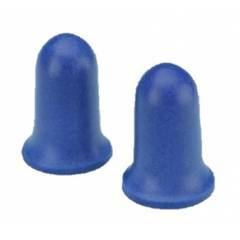 Elvex Blue foam plugs are easy to insert correctly due to their tapered shape and slow expansion rate. Elvex specially formulated low pressure foam provides the most comfortable fitting foam plug on the market. The dimensions of Elvex Blue allow virtually every ear canal to be fitted correctly. High visibility color makes it easy to monitor and enforce proper ear plug usage. Elvex Foam Earplugs (Pack of 50) is a premium quality Hearing Protection from Elvex. Moglix is a well-known ecommerce platform for qualitative range of Hearing Protection. All Elvex Foam Earplugs (Pack of 50) are manufactured by using quality assured material and advanced techniques, which make them up to the standard in this highly challenging field. The materials utilized to manufacture Elvex Foam Earplugs (Pack of 50), are sourced from the most reliable and official Hearing Protection vendors, chosen after performing detailed market surveys. Thus, Elvex products are widely acknowledged in the market for their high quality. We are dedicatedly involved in providing an excellent quality array of Elvex Hearing Protection.